This is the path of the F-4 intensity Louisville, Mississippi tornado that occurred Monday evening. This is one happy reader! I went back through Mr. Kaufman's reviews on Amazon and he is a tough critic: Some books he gives one-star. This author is thrilled he enjoyed Warnings so much. While I am very pleased that Amazon has apparently sold 11 copies since Saturday, it makes me concerned that Amazon, yet again, is going to run out as we approach Mother's Day, Father's Day and graduations. While you can get Warnings at Barnes & Noble and your local book store (they can order it if they do not have a copy in stock), if you want to buy it from Amazon, please get your order in ASAP. While the threat of "super tornadoes" is low today, the threat for destructive tornadoes still exists. On this Storm Prediction Center forecast, 5% is the significant threshold where you should pay attention to the weather as thunderstorms approach. People in the 10% area should be especially vigilant. 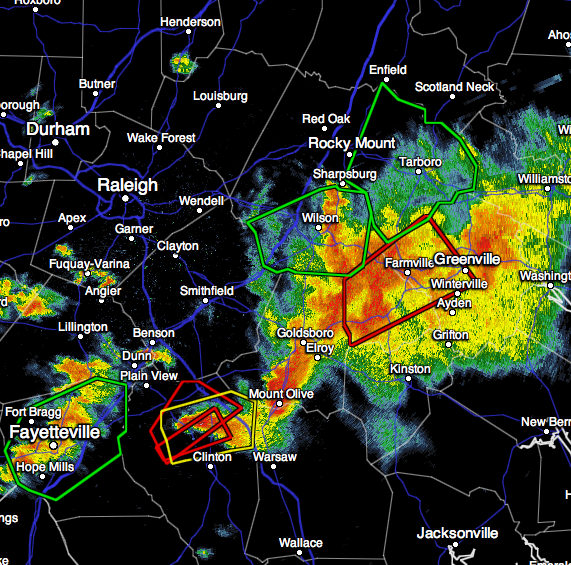 The red polygons are tornado warnings. 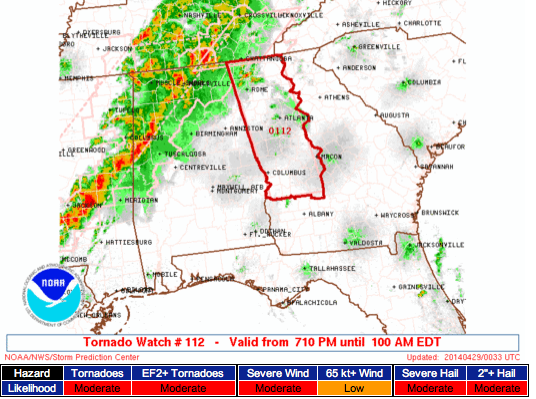 The first tornado watch of the afternoon has been issued. 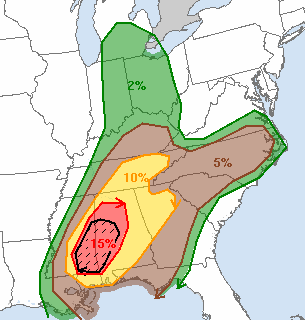 Day three of this multi-day tornado outlook is upon us. Five percent is the significant threshold for tornado risk. Both Atlanta and Nashville are in the 10% area. The hatched area is where strong tornadoes may occur. If you live in these areas, please keep up on local weather information. In addition to the tornado threat (more on that shortly), there is a major flood and flash flood threat through tonight. Maroon is a flash flood warning. 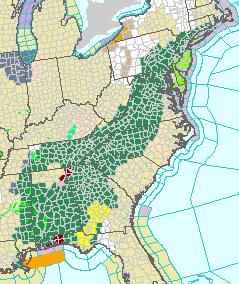 Greens are flood watches. The yellow is an active tornado watch. 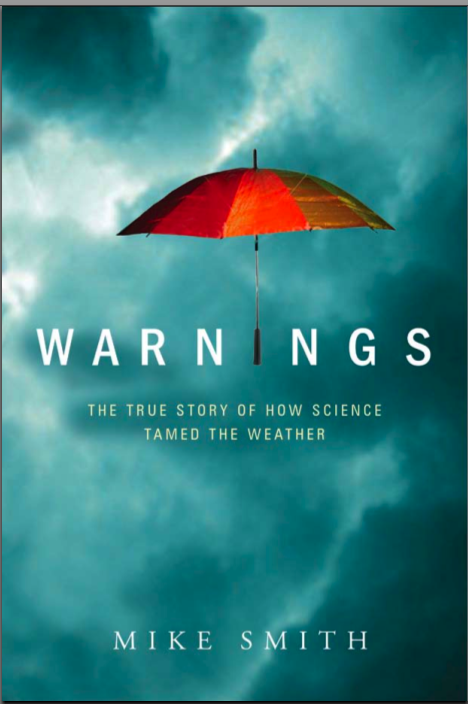 Have had a surge in sales of Warnings: The True Story of How Science Tamed the Weather. Amazon tends to turn out before holidays. So, if you would like to make sure you get a copy, please order soon. After two days of nearly non-stop typing, this is the last update for the night. Please consider the overnight tornado precautions (below). I'll have an update in the morning as to Tuesday's severe weather threats. How Do I Keep My Family Safe in an Overnight Tornado? NOAA Weather Radio, preferably with your county (and, maybe one county to the west) programmed in and set to go off only for a tornado warning. That way, you aren't awakened by severe thunderstorm warnings or non-pertinent counties. Subscribe to WeatherCall. This is more precise than weather radios so you are even less likely to be awakened for a false alarm. Put the AccuWeather app on your cell phone. It will let you know if a watch, etc., is issued. If you live in an area with tornado sirens, crack your window so you might hear it better during the night. Or, you can just sleep in the basement or safe room. 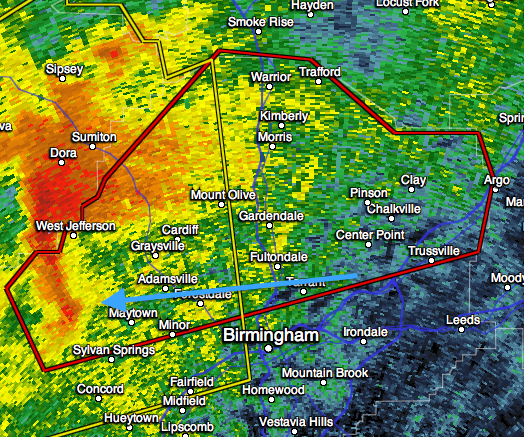 Tornado Warning for Birmingham & Jefferson Co.
11:45pm. Tornado warning has expired. 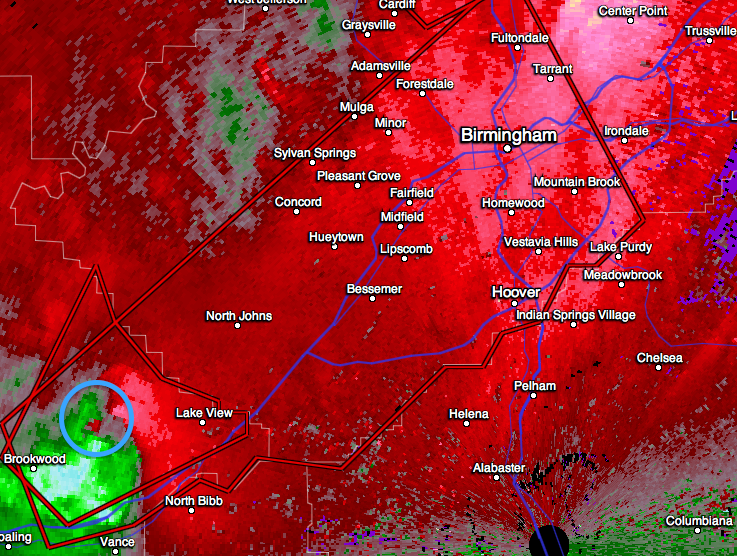 There is still some weak circulation near Homewood and just north of downtown Birmingham. People in Mountain Brook and Tarrant should keep an eye on the storm for the next few minutes and take shelter if it appears threatening. Considerable damage and injuries reported in Bessemer. Last update. 11:31pm, latest position circled. Damage confirmed. 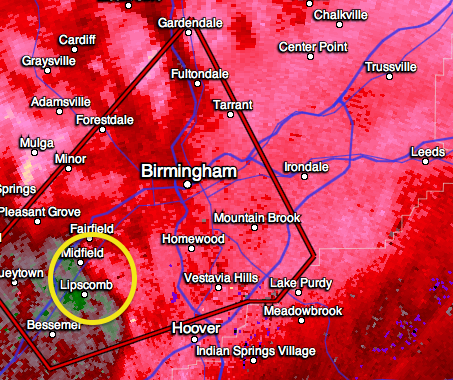 Take cover throughout Birmingham Metro! 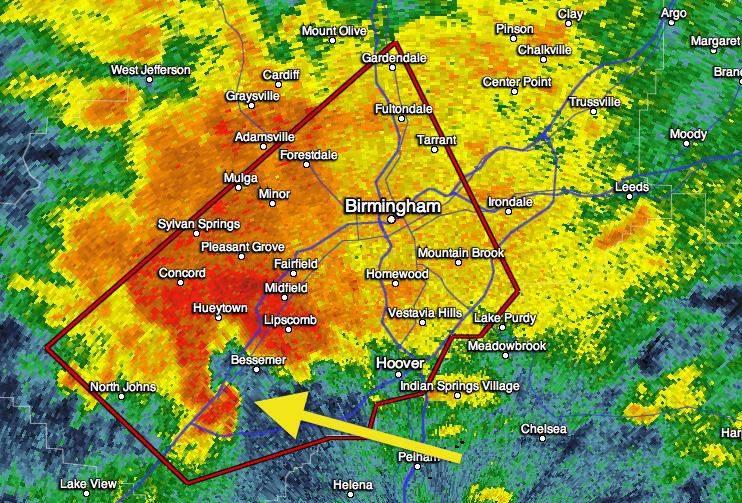 11:19pm, classic "hook echo" (arrow) near Bessemer moving toward Birmingham. 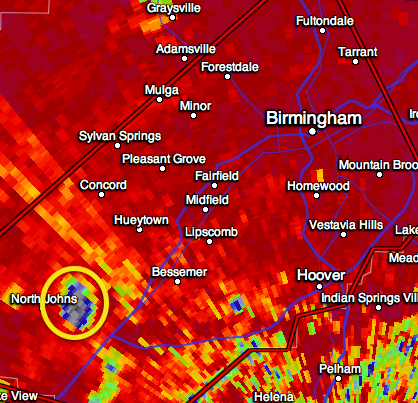 11:10PM dual-polarization radar shows debris lofted high into the atmosphere by the tornado (circle) as it moves northeast toward Birmingham. Very dangerous nighttime tornado situation. 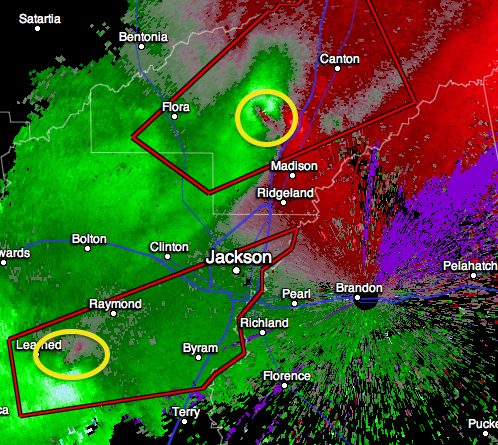 I have indicated both the hook echo (arrow) and the rotation (circle) which shows a strong tornado. 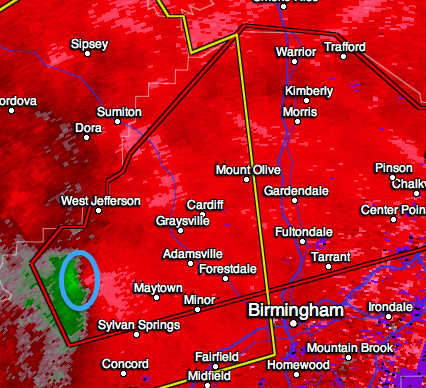 Take cover immediately, including the city of Birmingham. 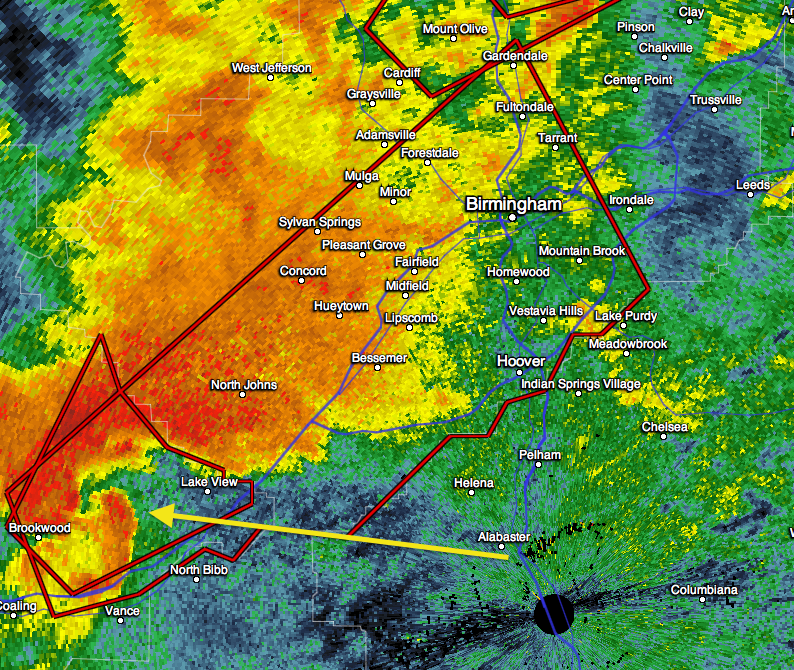 Tornado Warning for Birmingham Metro! 9:47pm, storm weakened, tornado warning cancelled. However -- there are other storms to the west. 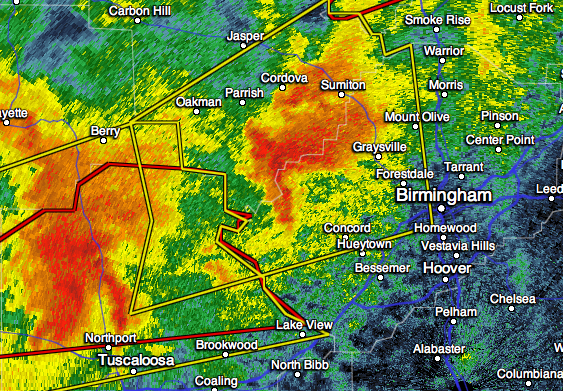 As I feared, a tornado warning is out for Jefferson Co., Alabama, including the north half of the Birmingham Metro. Take cover now!! 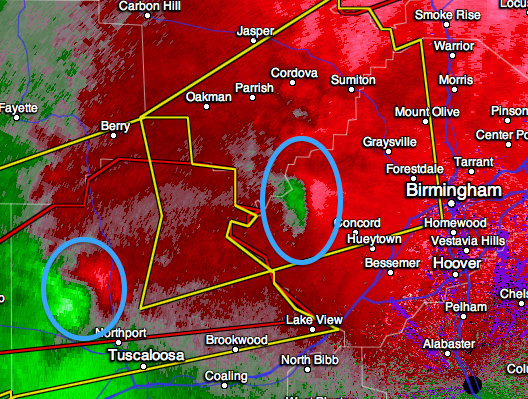 There are two thunderstorms approaching the Birmingham Metro at 9:13pm with broad rotation. Please turn on James Spann or your weather radio in case a tornado warning is issued. Click to enlarge graphics. This is valid until 8am EDT. Five percent is the significant threshold. Note this includes Atlanta. 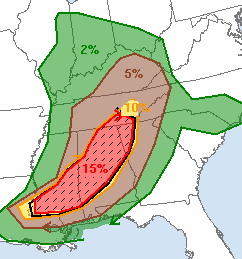 The area hatched is where violent tornadoes are forecast to occur. See nearby posting for suggestions for keeping your family safe in an overnight tornado situation. Extreme hook echo = tornado signature. 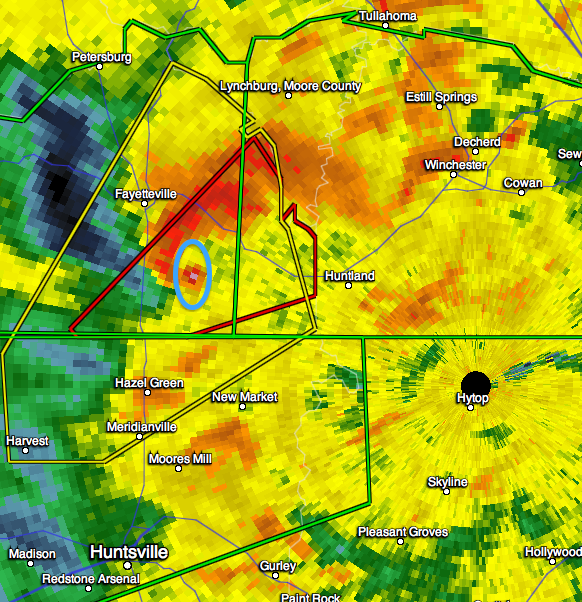 I have indicated the hook echo (arrow) and the circulation (circle) as of 9:37pm EDT. Take cover now! The hook echo is west of Trenton. This storm is moving northeast. 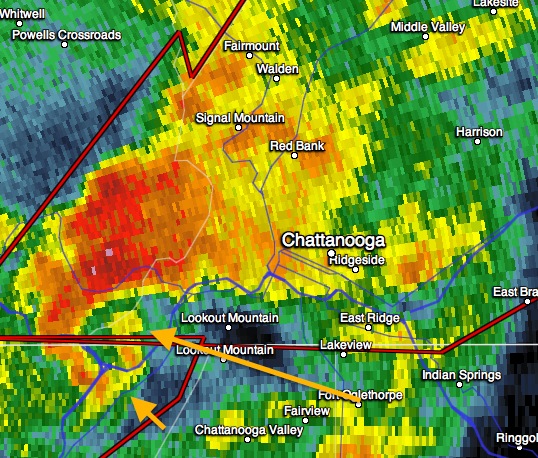 People in Chattanooga should keep an eye on this approaching storm. 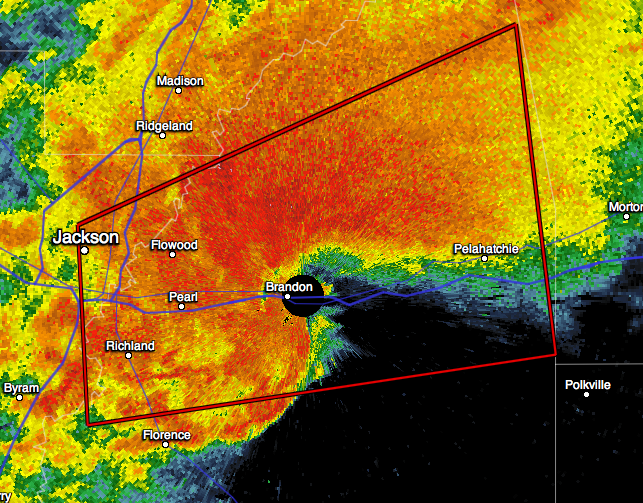 I'm shocked there is no tornado warning on the Jasper, AL signature. 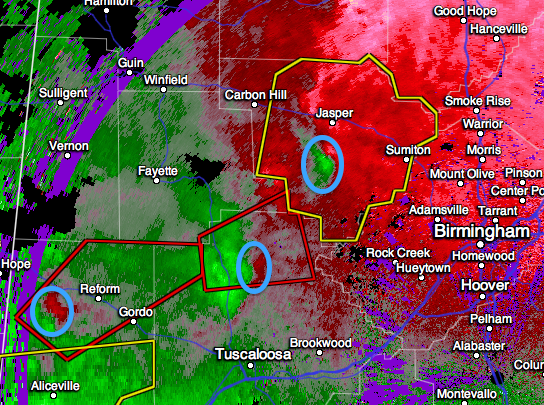 Three areas of rotation are circled and moving NE. Forget the darkness, this tornado is completely rain-wrapped and invisible. 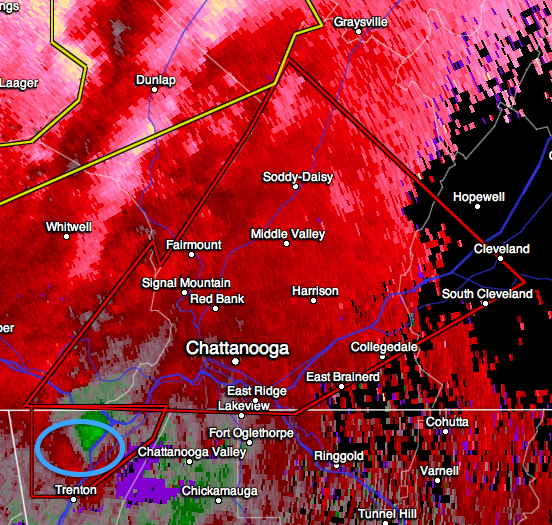 That is a debris ball (circled) confirming the tornado is on the ground. 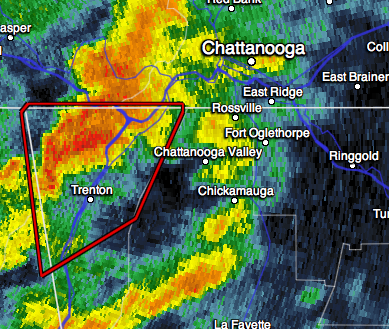 Take cover in the tornado warning (red polygon)! Storm moving northeast. 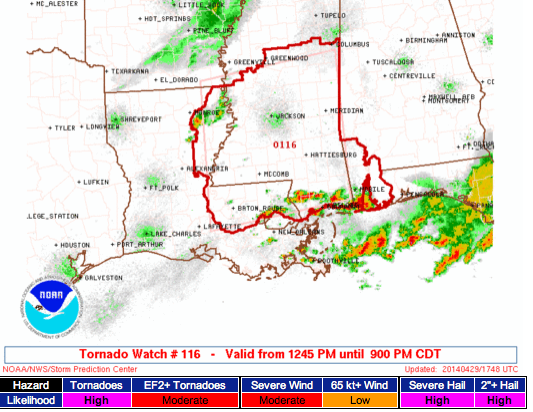 As just posted (scroll down), the tornado watch was extended to 3am CDT. Here are the current tornado warnings as of 8:15pm. Note the probability of tornadoes is "high" and strong tornadoes "moderate." 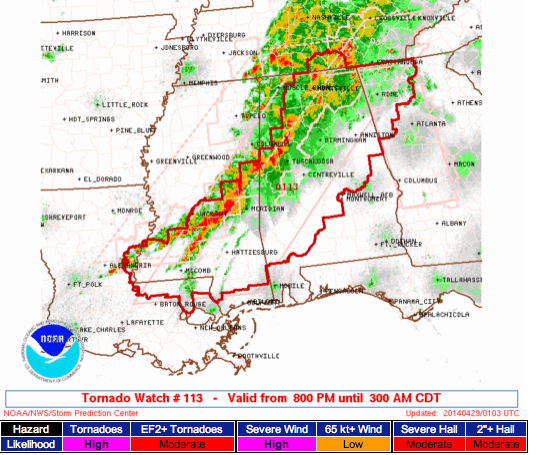 This tornado watch is valid until 3am CDT/4am EDT, so it could be a long night. 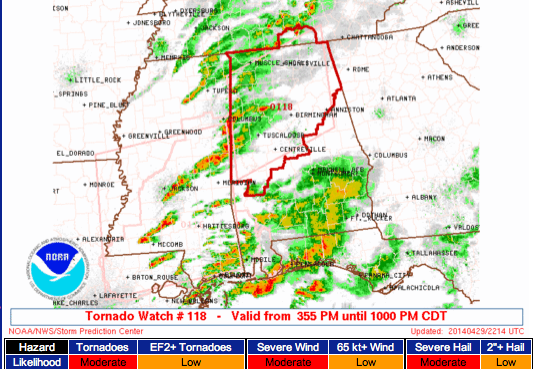 I think this tornado watch may be premature as I don't think the main threat is until later in the night. 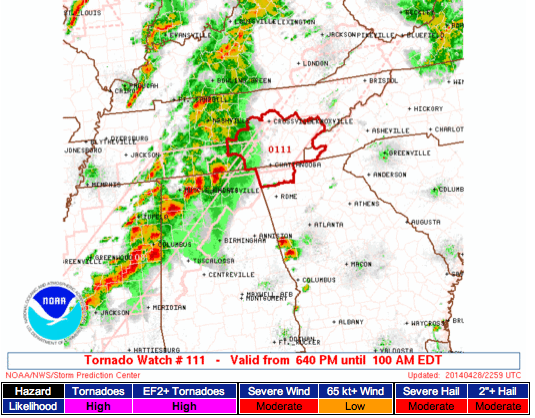 That said, there is now a tornado watch for west central and northwest Georgia, including Atlanta. We have had more than 10,000 new readers in the last 24-hours if the web metrics are correct. The blog is brought to you by Mike Smith Enterprises, LLC. We have two books out, Warnings: The True Story of How Science Tamed the Weather and When the Sirens Were Silent the story of the Joplin tornado. Both books are highly-rated by both critics and readers. We also do professional speaking about weather and disaster risks. The goal of this blog is to cover weather, science and climate in an interesting and informative manner. We do not attempt to cover every storm but want to bring you heads up's on major weather situations. A special thank you to our new readers and we hope you enjoy the blog. 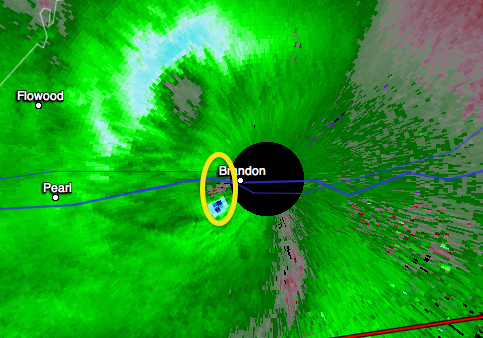 The tornado is going to move across Brandon, MS and it may hit the NWS and their radar which is at the center of the black circle. Confirmed damage. One report of "emergency conditions" in the Jackson area. 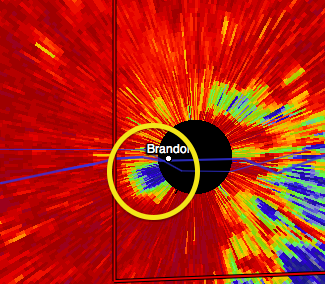 Considerable lofted debris detected by dual-polarization radar. Apparently, the tornado passed just south of the radar. It is still on the ground. 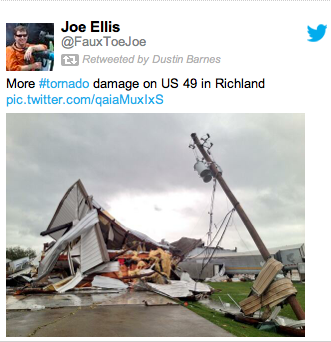 "Heavy damage" reported with this tornado. 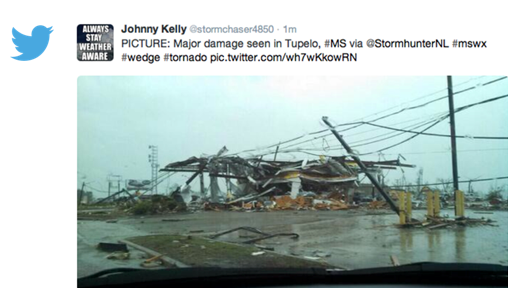 2 miles WSW of BRANDON, MS-Many homes damaged. Search in progress. 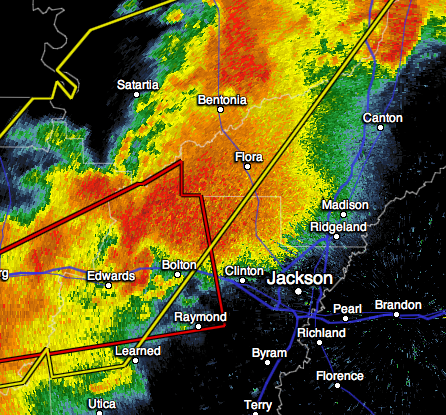 TORNADO in progress in Richland, MS suburb of Jackson moving toward Pearl & Brandon, MS. Damage confirmed. Take cover immediately. Also… tornado on the ground east of Canton, MS moving toward Carthage. 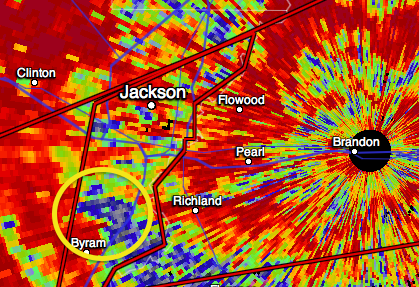 I have circled lofted debris in the southernmost part of the Jackson, MS area. A classic "hook echo" is visible below. 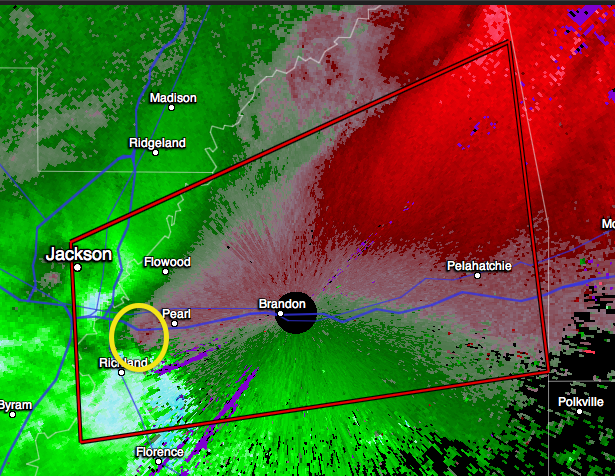 This storm is moving toward Pearl and Brandon. Take cover now. I have arrows pointing at the tornado risk areas. 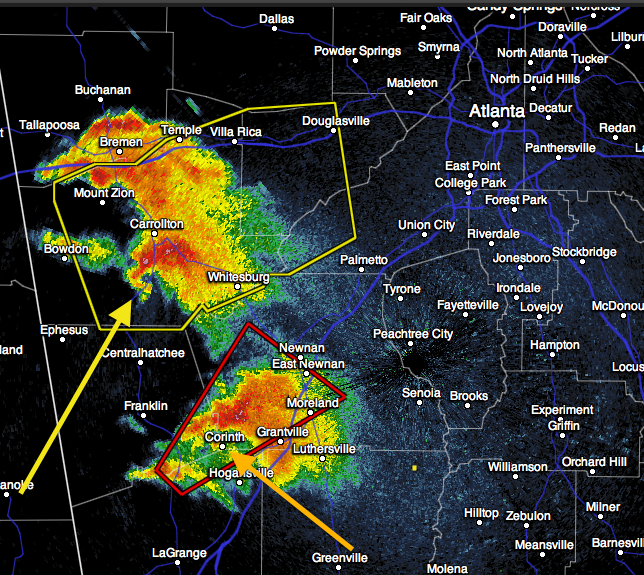 I am very surprised there is no tornado warning on the storm west of ATL. Please take cover if that storm appears threatening! If you a client of the company that lost communications with the National Weather Service and can't get the latest tornado warnings, please consider switching to AccuWeather Enterprise Solutions. We are the only organization that issues B2B tornado warnings (and all other types of storms) tailored for businesses. While we receive all of the NWS warnings as an additional source of information, you have a superior layer of protection with the SkyGuard® warnings from AccuWeather. Just this afternoon, we provided 17-minutes additional warning to our clients in the Tupelo area when compared with governmental sources. AccuWeather Enterprise Solutions help businesses protect their people, property and profits. Call us today -- the next storm may already be on the way. 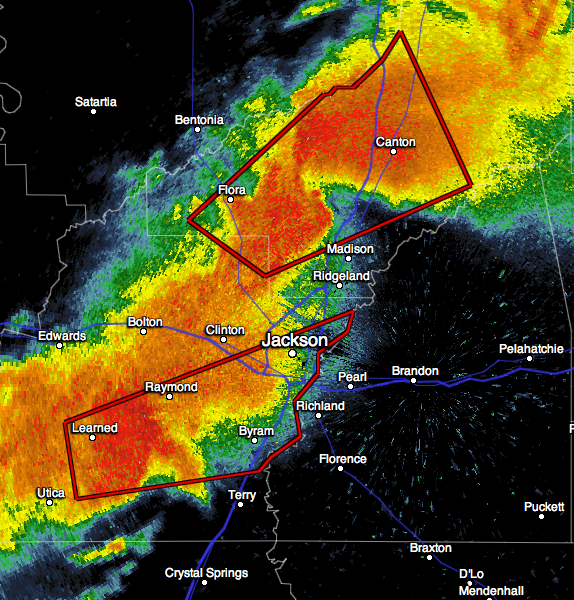 City of Jackson, MS is now under a tornado warning. 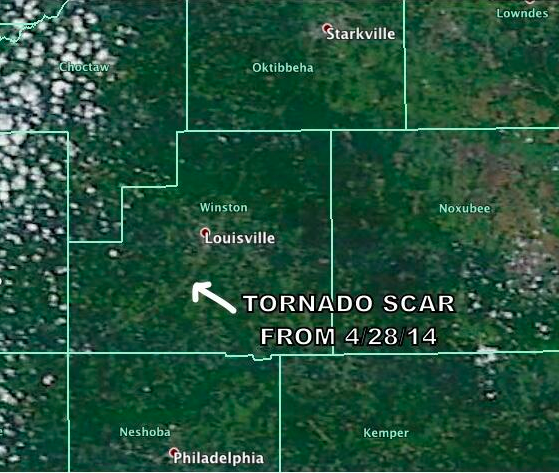 The locations of the two tornadoes are circled. Note: The probability of strong tornadoes (≥F-2) is "high." Please make preliminary precautions for sheltering and make sure friends and family in the area are aware of the threat. Substantial footware. If your area is hit, you don't want to be walking over nails and glass. Cash, in case you cannot get to an ATM. 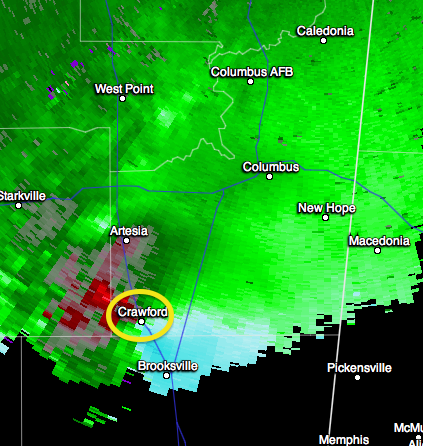 At 5:38pm a clear signature of a tornado is over Crawford, MS. It is moving toward the City of Columbus-New Hope-Macedonia (AL) area. Please take cover in these areas as this is a highly dangerous situation! Another tornado at 5:34pm is near Harvest, Ala. It is moving east to ENE. 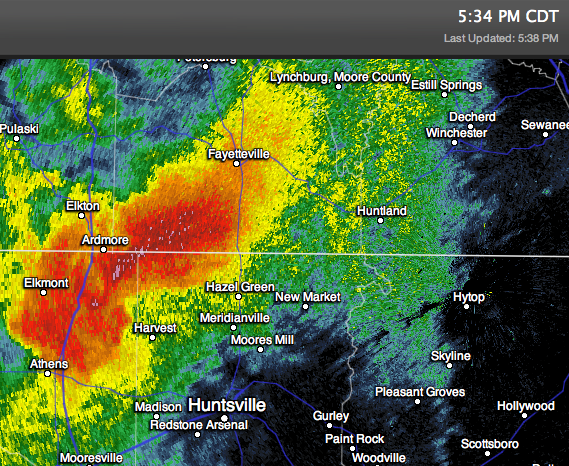 It will pass north of Huntsville. Please make sure friends and family are in shelter. The storm is moving at nearly 50 mph. 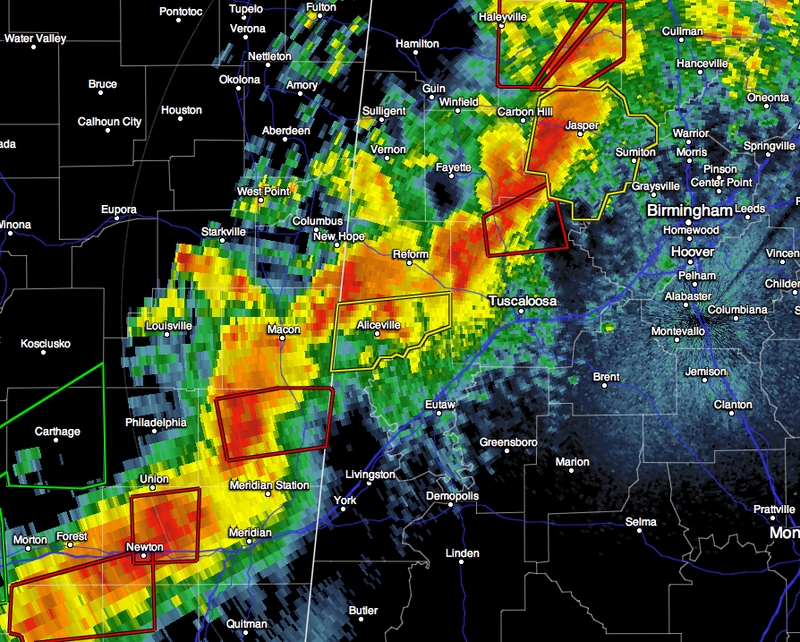 Multiple tornado warnings continue in effect. I have circled two areas of rotation at 5:28pm. 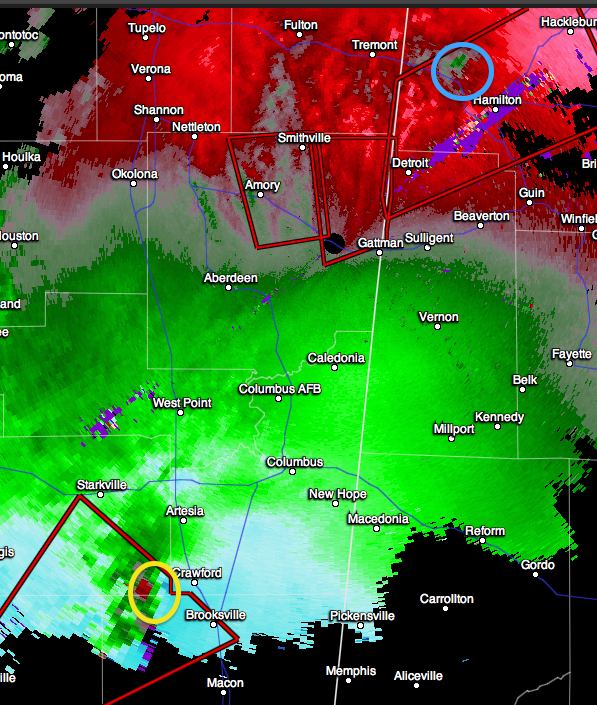 Note that one is moving in the general vicinity of Columbus, MS. 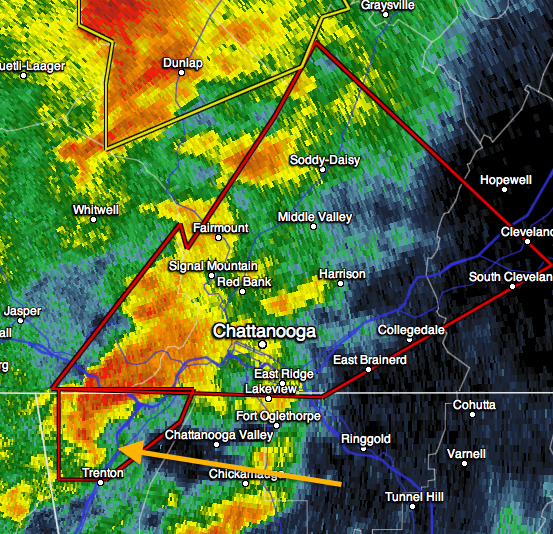 Please take cover in the red polygons and, with the southern storm, as far northeast as Columbus. Call your friends and family to insure they are aware of the threat. UPDATE 5:45pm, Tornado on the ground near or just south of Flora, MS. Is moving E to ENE. 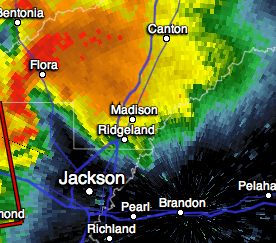 Take cover toward Madison and Canton as the storm passes north of Jackson. 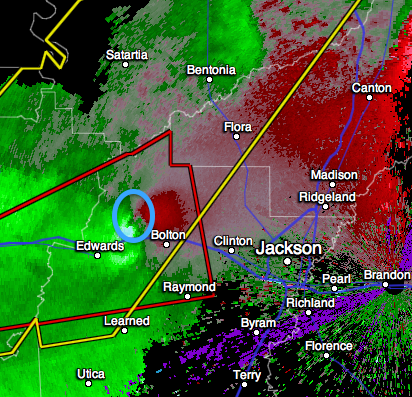 The tornado is now near Bolton, MS. 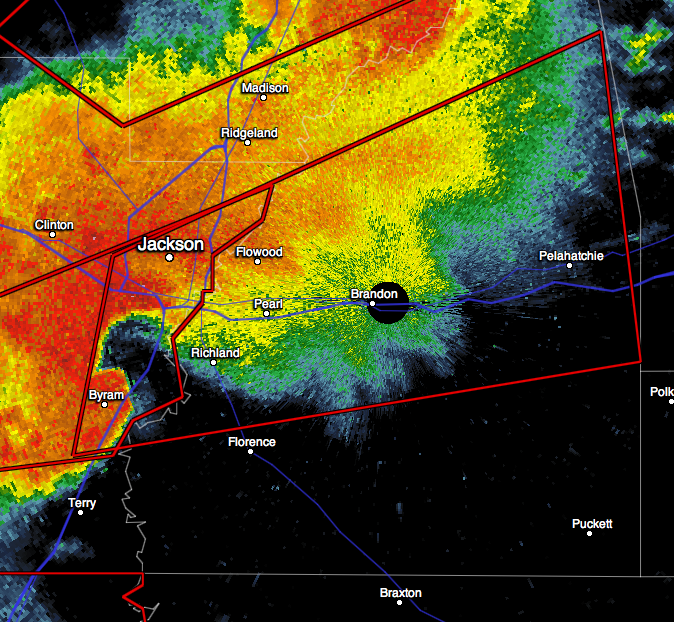 The far north and west suburbs of Jackson, MS need to be aware of a tornado approaching. Please take your tornado precautions. Radar at 5:27pm. Below is the velocity data, indicating the likelihood of a strong tornado. It is moving just north of due east.